The growing world of Windows 10 laptops just keeps making it harder and harder for the MacBook Pro to hold its ground, the latest example being the Asus ZenBook Pro 15 (UX580). Asus’ newest version of its 15-inch laptop for prosumers and creative types – not to mention light gamers – piles on the power in nearly every regard — from its impressive graphical capabilities to its incredible Pantone validated display. The laptop’s so-called ‘Deep Dive Blue’ aluminum unibody with rose gold edges measures a mere 18.9mm (0.74 inches) thin and weighs a measly 1.86kg (4.1 pounds) for its large screen size. Speaking of which, that screen is a professionally-calibrated 4K IPS touchscreen (a Full HD option is also available). Perhaps the most striking addition to Asus' ZenBook Pro laptop range is the decision to go with a contextual touchscreen in place of a traditional trackpad. Dubbed the ScreenPad, the 5.5-inch color touchscreen offers a Full HD display and is said to provide new ways to interact with Windows apps as well as dedicated ScreenPad apps. Whether the ScreenPad will indeed be implemented in a useful way that allows it to rise above gimmick status remains to be seen. However, in terms of functionality, it seem like a more practical approach than what Apple has achieved with its MacBook Pro with Touch Bar. Within, the new ZenBook Pro 15 can be configured with Intel 8th generation processors from Core i5 up to the latest Intel Core i9 with six cores. Backing that up is an Nvidia GeForce GTX 1050 graphics chip, 8GB to 16GB of DDR4 memory and an SSD up to 1TB in capacity. Asus is also touting a new, special cooling system that will keep that Core i9 processor and GTX 1050 in check within such a small chassis. All of this is promised to last up to 9.5 hours on a charge. Rounding out the laptop’s featureset is 802.11ac Wi-Fi and Bluetooth 5.0 for advanced wireless connectivity, backed by two Thunderbolt 3 ports, two USB 3.1 ports, an HDMI port, a microSD card reader, a TRRS audio jack and a proprietary port for charging. The Asus ZenBook Pro 15 (UX580) is due to arrive mid-July 2018 with prices starting at $2,299 (AU$2,999 / around £1,710). Though it has yet to be officially revealed, Asus has announced that a 14-inch ZenBook Pro 14 with ScreenPad (UX480) is slated to debut later in 2018, packing an 8th Gen Intel Core i7 processor and Nvidia GeForce GTX 1050 Max-Q graphics card. 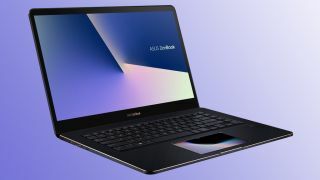 Other ZenBook Pro 14 features include support for Intel Optane memory, a Full HD NanoEdge display, facial recognition via infrared camera and built-in support for Amazon Alexa voice-powered services. Whether the 14-inch ZenBook Pro will be released across all territories has yet to be confirmed. Expect to hear more about it in the coming weeks.